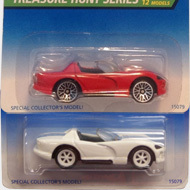 Treasure Hunts are a set of chase cars that have a much lower production run than regular Hot Wheels. They had their own series until 2013 when they became hidden within other series like “HW City” and “HW Racing”. A set of Treasure Hunts has been released each year since 1995. What are Super Treasure Hunts? Super Treasure Hunts are premium versions of regular Treasure Hunts that can have Spectraflame paint and Real Rider wheels. They were first released in 2007 and their production run is smaller than regular T-Hunts. What are Super Secret Treasure Hunts? As of 2012, Super Treasure Hunts are no longer premium versions of regular T-Hunts. They are a separate set with different cars that are randomly seeded into other series like “Muscle Mania” and “HW Showroom”. They still have Spectraflame paint and Real Rider wheels, but the packaging does not reveal that a car is a T-Hunt. The change in packaging and increased difficulty locating these hidden chase cars is why “Secret” is often added to their name. What is the low production symbol? The low production symbol is a flame inside a circle. As of 2013, the symbol is on regular Treasure Hunts. The packaging may also have the low production symbol and a message like “This symbol lets you know that this vehicle is hard to find and highly collectible.” If there is a message it will be on the card behind the vehicle. How do I identify a Treasure Hunt? Visit our How to Identify page for detailed information. Where do I find Treasure Hunts? Treasure Hunts are randomly inserted into cases of Hot Wheels. They can be found at retail stores such as Walmart and Target, toy stores like Toys”R”Us, grocery stores, drug stores, and almost any other place that sells Hot Wheels. On the secondary market, you can find them at swap meets, toy and die-cast shows, hobby shops, online specialty retailers, as well as on Amazon and eBay. When is the best time to find Treasure Hunts in stores? The best time varies from store to store. For big box retailers like Walmart and Target, when a store opens is often a good time. There may be Hot Wheels cases waiting to be shelved or the cars may have been restocked during the night. A few hours after opening can also prove fruitful if employees have to pull stock before taking it to the floor. For stores open 24 hours their restocking times may vary. You will have to learn when employees are most likely going to bring out new stock. For smaller retailers like Walgreens, CVS, and groceries new Hot Wheels are more sporadic. Often the whole chain of stores will get sent cases or displays all at once. So if one Walgreens has new Hot Wheels, there is a good chance the other ones in your area may have gotten some too. Seasonally stores get bigger shipments for the Christmas season, Easter, and special sale events. Being extra vigilant a few weeks before major events can prove successful. How many of each Treasure Hunt is produced? In 1995, 10,000 of each vehicle was made. In 1996, 25,000 of each was made. After 1996, Mattel has not revealed how many of each vehicle has been produced. The number of boxed sets is made known and each year has between between 1000 and 5000 sets. How many vehicles are in each set? 1995 through 2010 has 12 cars in each set except for 2005 which has a bonus 13th vehicle. 2011 onward has 15 cars in each set. What is a JC Penney set? From 1995 until 2002 JC Penney sold a boxed set of Treasure Hunts. As of 2003, these limited edition sets have been available to Red Line Club members. View boxed sets. What is the Red Line Club? 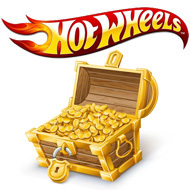 A Hot Wheels club by Mattel that offers exclusive cars and gives members first chance at ordering limited edition vehicles. Learn more at hotwheelscollectors.com. How many boxed sets of Treasure Hunts are produced? Boxed sets range from 1000 to 5000 produced each year. More info. How much do Treasure Hunts cost? 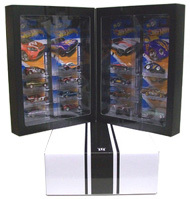 At retail, individual Hot Wheels cars usually cost between $1 – $2 depending on the store. On the secondary market, Treasure Hunts can range from a few dollars to several hundred dollars. A vehicle’s rarity, popularity, whether it is loose or carded, and the condition of the packaging all play a role in its value. What is the most valuable Treasure Hunt? The most valuable regular T-Hunt is the ’67 Camaro from the 1995 set. Its price often exceeds $400. What is the most valuable Treasure Hunt set? The 1995 set is the most valuable and the most limited with only 10,000 produced. The 1995 boxed set is valued at over $1000. Are there any Treasure Hunt variations? There are quite a few variations and errors. Some are minor with a slightly different colored graphic or a lighter shade of interior. Others are more drastic with different paint, wheels, or interior. View popular variations. Has the VW Bus ever been made into a Treasure Hunt? The VW Bus was a bonus vehicle in the 2005 set to celebrate the 10th anniversary of Treasure Hunts. Are there any motorcycle Treasure Hunts? There are several different bikes that have been released as Treasure Hunts. View motorcycles. What is a Real Rider? It is a 2-piece wheel that has a rubber tire with treads. There are a variety of different rims and tire designs. A vehicle with these wheels is often referred to as a Real Rider. View Real Riders. It is a translucent lacquer that creates a metallic appearance. The original Spectraflame was a transparent paint applied to a polished zinc plated casting. It was on cars from 1968 through 1972, but its use was stopped due to the health concerns of lead paint. The current Spectraflame is a translucent paint applied to a chrome finish. View vehicles with Spectraflame paint. It is paint with small metal flakes. The flakes reflect light giving a vehicle a sparkling effect and the appearance of more than one color. View vehicles with metalflake paint. A tampo is a graphic on a vehicle. The term comes from the process used to put graphics on Hot Wheels. An image is etched onto a plate. A silicone pad stamps the inked plate which transfers the image to the pad. The pad then stamps the vehicle transferring the image to the vehicle. Only one color is stamped at a time. If a graphic has three colors, three plates must be etched and each image must be stamped onto a vehicle. Learn more about tampography (Wikipedia).